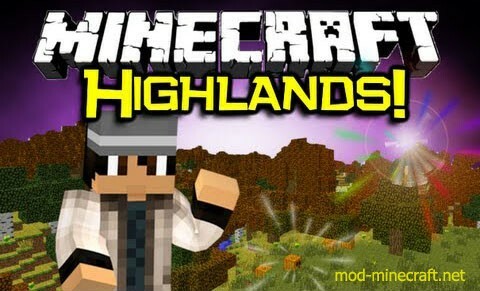 In Highlands Mod, highlands aims to be a comprehensive improvement of Minecraft biomes, trees and terrain. 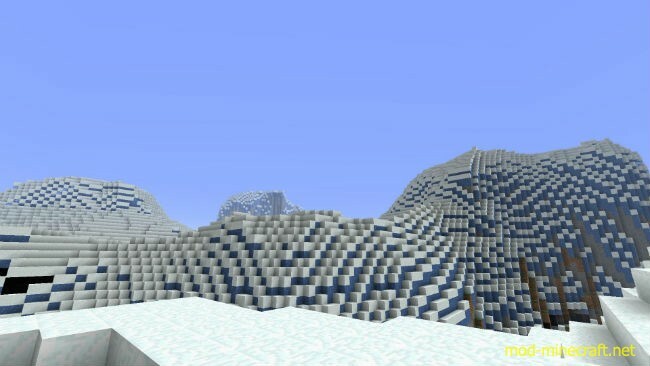 If you’ve ever felt bored exploring the world of Minecraft, this is your mod. Adirondacks: Tall mountains of dirt and exposed stone with forested foothills. Alps: Inhospitable mountains covered in deep snow with pine forests in the valleys. Badlands: Plateaus and valleys of clay and dirt. Bald Hill: A tall treeless hill that provides a good lookout point over forests. Bamboo Forest: A dense forest of thin bamboo plants. Dry Forest: A low landscape covered in Aspen trees and shrubs. Grey Mountains: Ominous rocky crags covered in boulders and gnarled plants. The forested valleys contain many dead trees. Highlands: Rolling hills covered in shrubs and flowering plants. Lake: A small body of water that appears in many inland biomes. Poplar trees can grow on the shores. Lowlands: Scattered lakes and low hills with stone and pine trees. Meadow: An idyllic plain with poplar trees and many flowers. Mojave: A dry semi-desert with red sand and Acacia trees. Pinelands: Tall but weathered hills and mountains with pine trees and shrubs. Poplar Hills: Lakes and hills covered in poplar trees. Redwood Forest: A dense forest with fir and giant redwood trees, and a podzol floor. Tropical Hills: Tall hills with a forest of Eucalyptus trees. Tropical Islands: A player lost at sea might discover one of these palm tree covered islands. Aspen: A medium tree with light colored wood and autumn leaves. Bamboo: A small tree with a very thin stem. Eucalyptus: A tall straight tree that grows in the tropics. Fir: A tall thin pine tree with dark wood. Palm: A tropical palm tree. Poplar: A small tree that grows straight and thin. 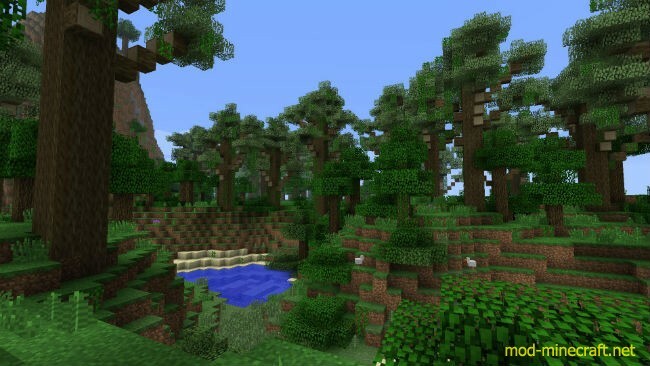 Redwood: A giant redwood tree that can grow to be more than 40 blocks. Dead: An oak tree that has lost all of its leaves. Great Oak: Oak trees can grow much more massive in the forests of Highlands. 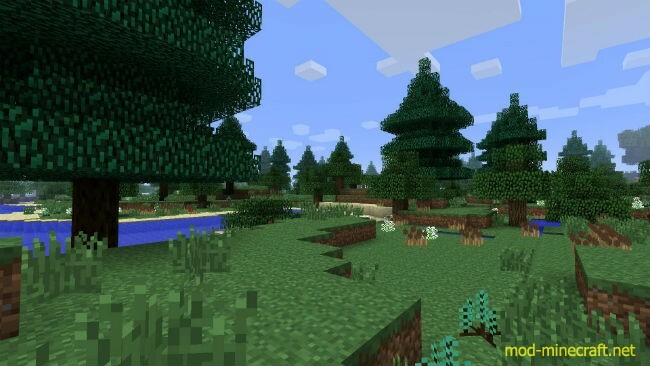 Shrubs: Pine and oak shrubs that grow low to the ground. Waterflower: Small blue flowers on a dark stem. Cattail: Reeds that grow in the swamps and wetlands. Cotton: A bush with fluffy white tufts that can be spun into cloth. Blueberry Bush: Wild blueberries that grow in hilly areas. Raspberry Bush: Wild raspberries that grow in hilly areas. Lavender: A purple flowering plant. Tropical Leaf Fern: A fern-like plant with one big leaf. Thornbush: A bush with prickly thorns.